The US justice department is to set increase pressure on judges in an attempt to speed up the processing of immigration cases, US media report. Judges will need to clear at least 700 cases a year in order to receive a "satisfactory" performance rating. But critics warn the plan could see hearings rushed and compromised, with an estimated 600,000 currently waiting to have their immigration cases heard. President Trump has demanded "tough" new legislation in recent days. He has posted several tweets pressing lawmakers to "act now". Administration officials say they are working on a new legislative package to close "loopholes" in current US immigration law, and may use the so-called "nuclear option" to push it through Congress with a smaller majority if necessary, the Associated Press reports. US Attorney General Jeff Sessions has been working on new policies to help clear the backlog of pending cases in immigration courts. In its guidelines, the justice department said that setting an annual minimum on the number cases processed will ensure that hearings are completed in a "timely, efficient and effective manner". Image caption The president is demanding changes to stop people crossing what he dubs America's "Weak Laws border"
Department spokesman Devin O'Malley said judges completed an average of 678 cases a year, but some judges completed more than 1,000 cases, the Washington Post reports. 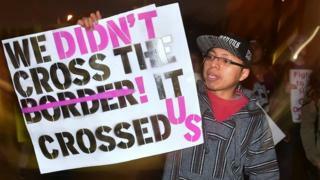 But the National Association of Immigration Judges (NAIJ) told the Post that the system could lead to legal challenges. "It could call into question the integrity and impartiality of the court if a judge's decision is influenced by factors outside the facts of the case, or if motions are denied out of a judge's concern about keeping his or her job," NAIJ President Ashley Tabaddor said. How did Melania Trump get 'Einstein visa'? The American Immigration Lawyers Association (AILA) told the Daily Beast website that judges should not be put under undue pressure to clear the backlog of cases. "We're very concerned that cases will be rushed through the system and due process will be circumvented with these new quotas," AILA Senior Policy Counsel Laura Lynch said. Daca Dreamers: What is this immigration debate all about?